Automatic floor scrubbers can provide the fastest way of scrubbing and cleaning the floors of just about any type of facility. They are indispensable when cleaning in a variety of commercial and industrial settings from convenience stores to warehouses and are huge time savers. One pass over the floor and your floor is clean and ready to be walked on. If you want to see your floors cleaner and shinier than they have ever been before (in a fraction of the time it would take to clean with a mop and bucket) then you need to look into investing in an automatic floor scrubber. When shopping for an automatic floor scrubber some of the items you should consider are machine features, user ratings, and user-friendliness. 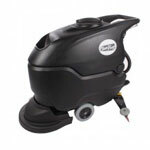 Most customers look at the features of floor scrubbers first. These features provide an idea of how well the floor scrubbers will perform for the cleaning tasks the customer has. They provide a picture of the floor scrubbers as intended by their manufacturers. While features of floor scrubbers are important, they are not the only consideration that should be made. A second issue you should think about when purchasing a floor scrubber is user feedback. User feedback provides valuable insight into how well the particular floor scrubbers worked. These ratings and comments are especially helpful when trying to decide between two or more models of floor scrubbers. When reading user ratings, be sure to also read the comments that generated the ratings. Often, users rate floor scrubbers on a few features, features which may not apply to your cleaning needs. Another tip is to make sure many users have given feedback to reach the rating of the floor scrubbers. Floor scrubbers with a lower rating may be the perfect model for you, just not the perfect model for the only person that rated it. The more users rating the used floor scrubbers, the more accurate the information. Another important consideration you should make when purchasing floor scrubbers is user-friendliness. Floor scrubber operation should be easily learned. If you purchase floor scrubbers that are difficult to operate or hard to understand, you're losing valuable time that could be spent cleaning your floors. The more easily the floor scrubbers are used, the more efficient they are.